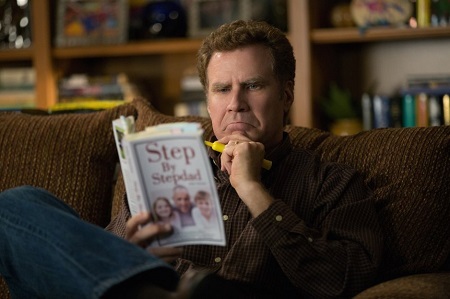 Brad (Will Ferrell) is a successful advertising executive working at a Smooth Jazz radio station. He is married to the beautiful Sarah (Linda Cardellini), trying his best to be a loving, approachable and caring stepfather to her two children, Megan (Scarlett Estevez) and Dylan (Owen Vaccaro). Just as things appear to be turning a corner, right when acceptance by the pint-sized duo is about to be achieved, back into their lives comes Sarah’s mysterious, free-wheeling, world traveler ex-husband Dusty (Mark Wahlberg). 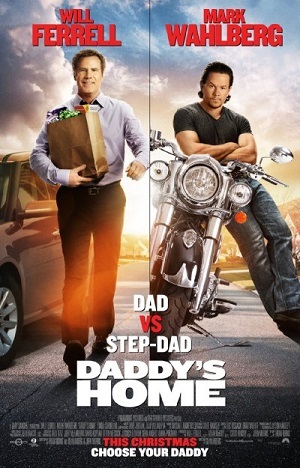 Suddenly it’s step-dad versus biological dad, the two men trying to one-up one another in an attempt to win approval from Megan and Dylan while also proving to their mother just how awesome each of them can be. Daddy’s Home feels like a half-baked “Saturday Night Live” skit that’s for some reason been stretched out to feature length. The basic thrust is rather simplistic, and where things are headed is obvious from the first moment Brad attempts to pick up Dusty at the airport. Director Sean Anders (Horrible Bosses 2), co-writing the script with Brian Burns (a staff writer on “Blue Bloods”) and John Morris (We’re the Millers), doesn’t attempt to go anyplace unexpected, keeping things moderately simple for every single one of the comedy’s quickly paced 96 minutes. That it isn’t a complete waste of time is a testament to the talent involved, and I’m not just talking about Ferrell and Wahlberg. Supporting players like Thomas Haden Church and Hannibal Buress play vital roles, both arguably having more laugh-out-loud moments than either of their above-the-title co-stars do. Additionally, for a PG-13 feature that pushes its rating right up to its edge (a sequence at a fertility clinic, anchored by a scene-stealing Bobby Cannavale, is especially ribald), Anders somehow still manages to craft a sweet, some might even call it saccharine, tone, fashioning an aura of familial warmth and understanding that’s moderately heartwarming. But it’s Ferrell and Wahlberg who keep this engine revving like it does, a statement that shouldn’t come as a shock for all of those who watched the pair’s 2010 hit The Other Guys. They are a great comedic team, the two working off one another with an easygoing effortlessness that’s wonderful. Wahlberg is particularly good, his awe-shucks demeanor concealing a lethally magnetic charm that borders on Machiavellian. He’s a seductive hoot, and no matter how absurd or crazy situations might end up becoming he has a way of anchoring them in a form of uncertain, emotionally conflicted humanity that’s kind of touching. Better, he’s fearless, doing whatever he is asked no matter how embarrassing, and as such a number of the laughs he generates feel more organic to the narrative and less robotically manufactured, a similar statement I cannot make as it pertains to Ferrell. Still, as funny as the film can be, there’s no denying there’s not a lot going on, Anders and company stringing together a series of a loosely connected vignettes more than they’ve constructed a three act screenplay worth following all the way through to the finish line. Additionally, they’ve constructed a forgettably pedestrian role for the woefully underutilized Cardellini, the talented actress once again relegated to afterthought even though her character is the one both Ferrell and Wahlberg are going out of their way to impress. But Sarah has nothing to do other than to wag her finger at both men in her life as if they were bigger children than her actual kids, allowing Brad and Dusty to get away with boneheaded bouts of lunacy that should land them in jail, not vault them to the head of the parental honor roll. There’s a great climactic gag, one that I surmise is a callback to Trainwreck as it pertains to Wahlberg. I will also say a sequence at a father-daughter elementary school dance is both funny and touching, a nifty little directorial balancing act on Anders part I didn’t see coming. But, as funny as it might be, Daddy’s Home is too inconsequential and slight to matter, the fact it does so little with its primary female character only augmenting my feelings on this front a substantial amount. Ferrell and Wahlberg remain a potent comedy team; I just hope the next time they join forces it’s in a better movie than this one ultimately, and sadly, proves itself to be.